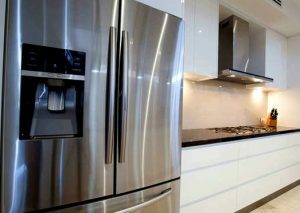 Found warm milk or frost buildup in your fridge or cool room in Adelaide? No need to fuss. Some problems are easy to fix. Others are complex and costly. It depends on the affected parts. When a fridge breaks down or functions weirdly, owners face a dilemma. Many aren’t sure whether to repair or replace. As fridge repair experts, we know when it’s right to fix or bin a faulty refrigerator. Because we’re in the know, let’s help you make a decision. Is the fridge plugged in all the way? Are the coils clogged with dust and hair? If so, dust them. Ice maker stuck in the off position? Having a problem with the water dispenser? Just replace the water filter. The food section isn’t cooling properly. Use a thermometer to keep track of this. Inside a fridge, temperatures range from 0-4 degrees Celsius. Noises emanate from the fan. The fridge isn’t dispensing water or making ice. Your fridge isn’t cooling at all. A buzzing sound comes from the compressor. Indicates that the compressor is defective. The fridge is 15 years plus. Upgrade to an energy-efficient model. Repair costs run into hundreds of dollars. Here’s how to extend your fridge’s life. Don’t overload the fridge with food and beverages. Overloading overworks the compressor. For efficient operation, remove all items that block air vents. Keep doors shut and limit the number of times you open them. When the doors are open, warm air flows inside. To keep food cold, the compressor has to work harder. Clean door gaskets so they seal well. It’s hard to open a fridge door if the gasket is full of sticky foods. Wipe gaskets with warm water. Vacuum refrigerator coils for your fridge to run efficiently. Discard expired and rotten food. This prevents contamination and keeps your fridge fresh. Nothing will have you pulling your hair out than a fridge on the fritz. If you’re a DIY pro or have a technician’s number on speed dial, you’re good to go. Repairing your fridge is cheaper than replacing. But we recommend buying a new appliance if your old one is problematic. Old is gold but not so when fridges are involved.